Apple shares are currently valued at roughly $124 each in intraday trading, giving the Cupertino-based company a record-breaking market cap exceeding $720 billion. Apple stock continues to rise after the iPhone maker became the first U.S. company to close with a market cap over $700 billion on Tuesday, the same day in which CEO Tim Cook spoke live at the Goldman Sachs Technology and Internet Conference. Apple shares have risen over 48% since the start of 2014, despite some critics suggesting that the company has faced a lack of innovation since the passing of late co-founder Steve Jobs. Apple has been particularly successful in China, which Cook claims has grown from a $1 billion to $38 billion market for the company in the past five years. Apple plans to expand from 19 to 40 retail stores in China over the next year to keep up with the high demand for its products in the world's most populous country. Apple announced its earnings results for the first fiscal quarter of 2015 last month, posting revenue of $74.6 billion and net quarterly profit of $18 billion, or $3.06 per diluted share. Apple sold a record-breaking 74.5 million iPhones during the quarter on the strength of the iPhone 6 and iPhone 6 Plus, paving the way for the company to report the most profitable quarter of any corporation ever. Cook confirmed on Tuesday that Apple will announce any potential changes to stock buybacks or dividends during its April earnings call. The chief executive added that Apple does not need as much cash as it is generating for operations, assuring that it is committed to returning money to shareholders through its capital return program. Other than my education, Apple stock has been the best investment I've ever made. Apple is doomed they said. I will say it again... AAPL is still undervalued. It should be trading around 160. 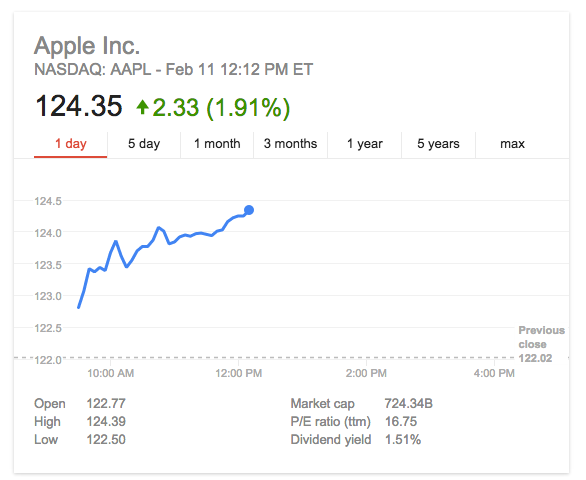 Apple's stock is up 25% since the iPhone 6 launched. Impressive. Last surge before the collapse. The Apple Watch will start a chain reaction of questionability about Apple products that people will go elsewhere for the same performance & experience at a lower cost. Just like last time Steve left, it's only a matter of time before Apple kills his legacy. Obama's eye's are popping ! He wants his his share so he could start distribution ! Rather than use the cash for stock manipulation and dividends they should pay it out to their workers. Time was when the producers got a share of the pie and the economy was better for it. We need to have a party here on MacRumors when Apple break the 1 Trillion market cap. Let's say it goes up only 50% from today's share price; that will put it around $186.35 in a year. Oh, that would be $1,304.45 pre-split. YES! !